Leon Lederman, the US particle physicist who shared the 1988 Nobel Prize for Physics with Melvin Schwartz and Jack Steinberger, died on 3 October aged 96. 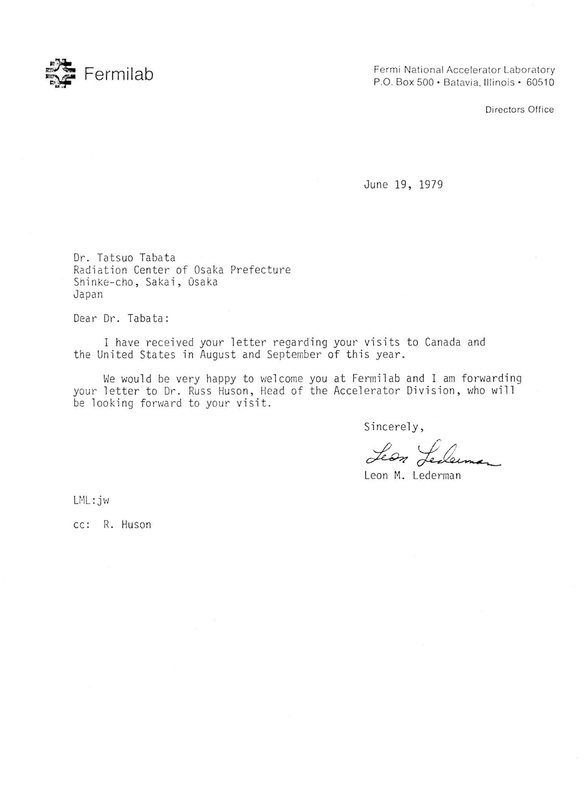 I happened to receive a letter type-written by Leon Lederman's secretary and signed by Lederman because I wished in 1979 to visit Fermilab, where he was the director at that time. I submitted his letter along with other overseas travel documents to the administrative department of the Radiation Center of Osaka Prefecture. So, I now have its Xerox copy only (see the photo). Fig. 1. Saiko Yoshihara's painting on the post card to tell about her solo exhibition. A friend of mine, Saiko Yoshihara, is a painter joining Shinsho Fine Art Association. She is going to hold a solo exhibition in Hanamaki, Iwate, from December 3 to 20, 2015. The other day I got a postcard from her. The card was to tell about the exhibition and carried one of her abstract paintings shown in Fig. 1. In this painting she used drip technique as used by Jackson Pollock. The black dots suggest something like remains of disaster (she lives in Soma, Tohoku region, where big earthquake occurred in 2011), but there are also images of a brain and a new life, which are going to overcome the disaster. The light and tender tone of colors in the overall work seems to emanate hopes for the future. Thus, I liked this painting very much. One thing in this painting surprised me. It was a series of black dots starting from lower left and going to the upper right. It is quite similar to experimental data plotted in figures of my physics papers. First, I was reminded of a figure in Ref. 1, which showed the range–energy relation of electrons in aluminum and copper in logarithmic scales. I draw the figure (see Note) by cutting the whole region of the vertical and horizontal scales into two and juxtaposing the different regions into one graph by the use of different scales for bottom and top as well as right and left. This made it difficult for laypersons to grasp the whole trend at a glance. Therefore, similarity appeared only in my brain. Fig. 2. 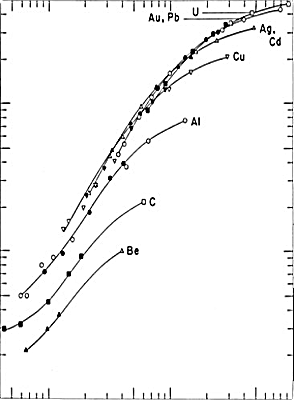 Range–energy relation of electrons in aluminum and copper in logarithmic scales. To make similarity visible to Saiko and other persons, I have made a new graph by combining two copies of the original figure. In the new graph shown as Fig. 2 above, each of the vertical and horizontal scales extends naturally over the whole region considered. The size of Fig. 2 is made equal to that of Fig. 1. Similarity is now seen between the series of dots in Saiko’s work and the long, two adjacent curves at the middle of the new graph. Fig. 3. Backscattering coefficient as a function of atomic number divided by the energy of the incident electrons. 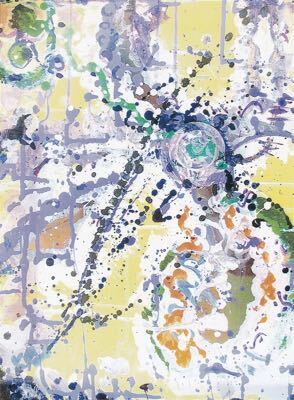 Saiko’s painting has other series of dots that deviate further from the uppermost one as they go further to right. This trend is also seen in the range–energy relations of electrons for higher atomic numbers, but the deviations are not so large as in the painting. Thinking about this, I was reminded of another figure in the other paper of mine, Ref. 2. This figure, reproduced in Fig. 3 with modification to make the size equal to that of Fig. 1 again, shows the backscattering coefficient as a function of atomic number divided by the energy of the incident electrons. Data for different materials lie on slightly different curves, similarly to Saiko’s plural number of series of dots. Why did Saiko, who has never seen the figures in my paper, draw dots arranged like those physical data? The curves represented by Saiko’s dots and experimental data in my papers are of the type called "S-shaped curve" or "logistic curve." Such a curve often appears in natural phenomena. It also represents one of natural paths of the movement of the right hand going from far lower left to far upper right on a large canvas of F100 size (162×130 cm). Considering these, it is not so strange to see such a similarity. It was the days when personal computers were not yet available, and I draw the figure by hand on a B4-size sheet of tracing paper. 1. T. Tabata, R. Ito and S. Okabe, "Generalized semiempirical equations for the extrapolated range of electrons," Nucl. Instrum. 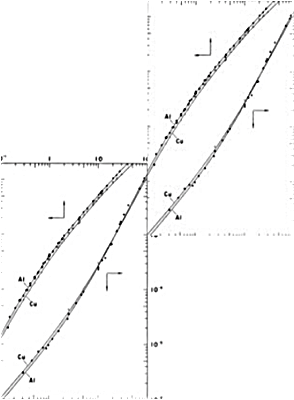 Methods 103, 85 (1972) (DOI:10.1016/0029-554X(72)90463-6, post-print available). This is the most cited paper in my publications (see here). 2. T. Tabata, "Backscattering of electrons from 3.2 to 14 MeV," Phys. Rev. 162, 336 (1967) (DOI:10.1103/PhysRev.162.336e, post-print available). This is my thesis paper. Shigeru Okabe was born in Kagoshima and studied at the seventh high school of Japan's old education system. Then, he entered the Faculty of Science, Kyoto University. He majored in experimental nuclear physics under Professor Bunsaku Arakatsu at the Department of Physics in a handicapped environment immediately after World War II and graduated from Kyoto University in 1946. In 1949, he became an assistant professor at Tottori University. There Okabe made use of the geographical advantage that Misasa hot spring with high radon content was close there to study natural radioactivity. His study of earthquake prediction by change in the atmospheric radon concentration (Ref. 1) is internationally known as the earliest of similar studies. In 1949, he became the Chief of Radiation Source Division, Physics Department, at the Radiation Center of Osaka Prefecture (RCOP), which was just established. There he was engaged in the construction of irradiation rooms and installation and maintenance of an electron linear accelerator with the maximum energy of 18 MeV. He also pushed forward varieties of researches such as monitoring methods of electron beams, the passage of electrons through matter, photo-nuclear reactions and characteristics of solvated electrons by the use of this accelerator. During that time, he obtained Research Grant for Peaceful Use of Nuclear Technology for six years in a row, showing his high capability of planning and advancing researches. In promoting research and maintenance work, he put the right man in the right post and also took care of the division members for getting doctor's degree or an academic position at another institution. 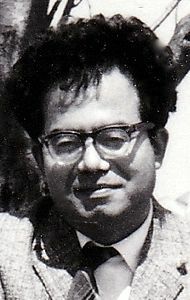 In 1973, Okabe was promoted to the Head of Physics Department, RCOP. Shortly thereafter, significant changes in the organization of research institutes were made by the Government of Osaka Prefecture to abolish the division system and to adopt the research group system. This made it necessary at RCOP to have the system of working groups in parallel with research groups for the maintenance and operation of facilities and equipment. In such an upheaval, Okabe exhibited his prowess in research management. At the same time, he contributed a lot of review papers to journals in the fields of applied physics and nuclear energy, and also showed much influence on the development of Radiation Division, Japan Society of Applied Physics. Okabe retired from the Head of Physics Department, RCOP, in 1981 and became professor at the Faculty of Engineering, Fukui University. While being engaged in education, he returned to the study of natural radioactivity. Making use of geographical advantage again, he studied radon concentrations in snow. He also played an active part in research committees, made outside the university, of exo-electron and radon. In 1989, Okabe retired from Fukui University and established Radon Science Laboratory at his home, continuing his study intensively. In 1993, he published a fine art book entitled entitled Collection of Occasional Sketches. It contains about sixty watercolors and drawings made as a hobby from his school days. 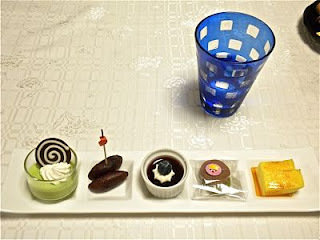 He was also known as a gourmet and often enjoyed going to good restaurants in Osaka and Kyoto. Leaving the great achievements as described above, Okabe passed away on June 30, 2013, at the age of 89. 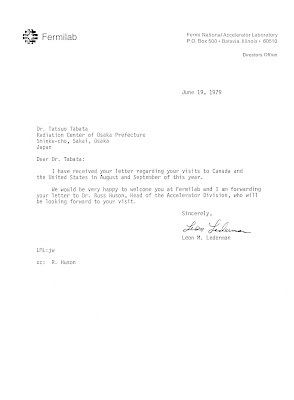 The author of this article, Tatsuo Tabata, is much indebted to Dr. Okabe for his kind supervision and enjoyable collaboration in the earlier years of the former's professional career. On June 7, my wife and I joined a bus trip to Exhibition of Paintings from State Pushkin Museum and Flower Festival Commemorative Park. We had lunch at a French restaurant, whose building was a nationally designated Important Cultural Property. At the lunch table, a couple younger than my wife and I took the seats in front of us. Let's call them Mr. and Ms. N. A glass containing water from the well of the restaurant and some ice cubes was prepared for each person from the beginning of the lunch course (see the photo above). At some stage of the lunch course, Mr. N took the glass and asked Ms. N if she could guess how to calculate the volume of the solid of such a form. She said, "Add a small cone to make it a large cone. Calculate the volume of the large cone and subtract the volume of the small cone from it." Mr. N replied that it would be very cumbersome. Then, he said that the volume can be obtained as the mean of volumes of three cylinders having the same height as the solid. His voice was so low that I was unable to hear the radii of the three solids, but from the movement of his hands, I supposed that he referred to the radii of the top and bottom circles of the truncated cone and a certain mean of the two. He additionally stated that we could obtain the formula by integration of the circular area. I had never heard of the formula for the volume of the truncated cone, and thought it wonderful that Mr. N learned it and remembered it for some reason. However, I also wondered why he who spoke of a more complex method of integration said that his wife's simpler method was cumbersome. After returning home, I calculated the volume by Ms. N's method and easily found that the third radius mentioned by Mr. N was the geometric mean of the radii of the top and bottom circles. To see the formula and the derivation of it, visit here. The explanation is in Japanese, but readers might easily follow equations by looking at a diagram included. The third method mentioned there by the use of Pappus-Guldin theorem (also known as Pappus' centroid theorem; the second theorem is relevant here), however, might be a little difficult to understand, if you have never heard of that theorem.